How are you going to celebrate World Voice Day? 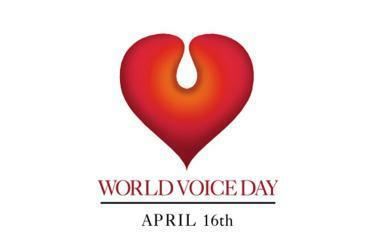 World Voice Day 2016, the annual event that encourages people across the globe to celebrate the phenomenon of the voice and encourages people to assess their vocal health, takes place Saturday, April 16. Begun in 1999 as a combined effort of American and European otolaryngologists and speech and language pathologists, World Voice Day is now observed worldwide. Celebration-related events include concerts, voice-clinic open houses, television shows, radio programs, workshops and more. For more information on each event, as well as a comprehensive list of the World Voice Day events in the United States, click here: http://world-voice-day.org/category/wvd-events/USA/ (updated daily). Click here to see events taking place in other countries: http://world-voice-day.org/events-2016/.